This Stihl brushcutter is a compact and lightweight trimmer perfect for domestic and light-commercial work, with a bull bar handle you can clear more grass in a smaller amount of time. The Easy2Start feature will provide the operator with effortless starting every time. 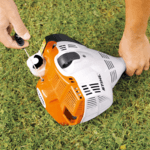 The Stihl Easy2Start system makes the task of starting your Stihl brushcutter so much easier. A spring accumulator supports the starting process reducing the the force needed to turn over the engine. Even pulling the cord slowly will start this Stihl brushcutter. 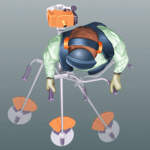 The bike handle can easily be use in conjunction with a harness providing support and allowing you to cover more ground when clearing. This method reduce fatigue on the operator and reduces the time need to get the job done. 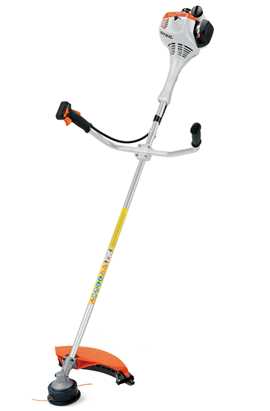 We stock a range of line trimmers, grass trimmers, whipper snippers and brushcutters in Ballarat at great competitve prices. We have cheap affordable grass trimmers for small domestic purposes and also heavy duty brushcutters for commercial or acerage purposes! We assemble and fuel and oil all our units before sale so that we know they are right and we also pass savings onto our customers buy providing great prices on all high quality products.